The Metrologic Orbit, the all-time, best-selling hands-free omnidirectional scanner presents an innovative, elegant and affordable solution to convenience retail applications where counter space is at a premium. Recipient of multiple design honors, its award-winning shape enables hand-held scanning of large, bulky items. For added flexibility, the scanning head can be tilted within a 30° range to accommodate objects of various sizes and shapes. Dimensions 102mm x 150mm x108mm. The Metrologic Voyager hand-held, single-line scanners have united form with function to become the industry benchmark for value and performance. These sleek scanners feature a patented automatic infrared activation and decode all standard 1D bar codes, including RSS codes. 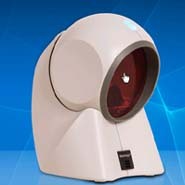 Available with codegate option to activate the scan with a single single button. 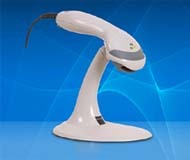 For presentation scanning, The stand allows it to be also used as a presentation scanner. Dimensions 198mm x 40mm x Handle Width: 45mm, Head Width 78mm. 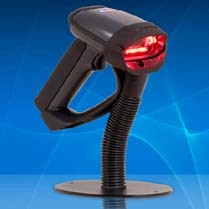 The Metrologic MS1633 Focus BT Area Imager Scanner is a high performance handheld bluetooth scanner. This omni directional scanner decodes virtually all of today's standard barcodes regardless of orientation. Where image capture is concerned the MS1633 Focus BT combines a high resolution CMOS sensor with powerful processor to provide a wide array of outputs at high rates of speed. tr> Dimensions 183mm x 111mm x Handle Width: 30mm Head Width: 79mm.